Johann Caspar Ferdinand Fischer (1656-1746) was a German middle-Baroque composer born in the Bohemian town of Schoenfeld (now present day Czech's Krasno). He was influential in bringing the French keyboard suite into the German-speaking countries, whose keyboard compositions were highly admired by Bach and Handel. He was also regarded by his peers as the finest keyboardist of his time. It's a shame that he is not more well-known today. After his young musical training in a Piarist school, he entered the court of the Duke of Saxe-Lauenburg, then held by Julius Franz. Franz was a cultured man, and he made sure that he had a large kapelle group. Fischer was able to further improve his music studies in the court, but most importantly, he was to be exposed to a variety of different musical styles. The one composer who made the largest impact on him was French composer Jean-Baptiste Lully, whose orchestral suites he studied in great detail. It is not clear whether or not Fischer actually spent extended periods of time in France, but he certainly had ample access to Lully's pieces. Georg Muffat, a pupil of Lully, was in the Vienna - Prague - Salzburg area, and he distributed his teacher's music around. After Julius Franz's unexpected death in 1689, the royal household of Saxe-Lauenburg would endure several difficult years. Leaving no male heir, Franz's two daughters would marry other wealthy royal families. His younger daughter Sybilla Augusta would wed Ludwig Wilhelm, Margrave of Baden-Baden, also known as "Turk Louis" for fighting the Turks on the battlefront. Fischer would move with the Baden, where it was not until 1714 that he secured a position as the Kapellemeister to the Baden court. By this time, Ludwig Wilhelm had passed away, and the margravine Sybilla Augusta acted as the regent to Baden-Baden. Fischer would write to sets of suites dedicated to Sybilla Augusta and her granddaughter (albeit 40 years later). The set of 8 harpsichord suites recorded here are titled "Musicalisches Blumen-Büschlein" (Little bunch of musical flowers) and was dedicated to Sybilla Augusta to celebrate the birth of Prince Karl Joseph. These pieces are not original works, but a reworking of an earlier publication called Pièces de Clavessin, a reference to the great Chambonnières, founder of the French harpsichord school. 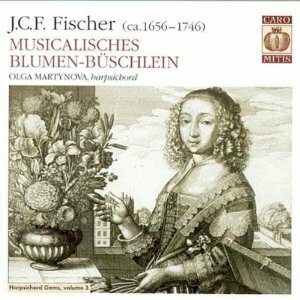 Sybilla Augusta was an amateur harpsichordist, and because of this, Fischer's pieces do not require much technical skill to perform, but it is still well-written music. The suites here deviate significantly from Froberger's early suite format of Allemande - Courante - Sarabande - Gigue. In fact, out of the 8 suites here, only the 6th suite follows this format and includes all these dances. For the remainder of the suites, Fischer would include an assortment of other dances, like the Gavotte, Rondeau, Canaries, Passepied, Bourree, and Menuet, which were making their way into French orchestral suites at time. Those familiar with Bach's keyboard suites probably take these dances for granted, but keep in mind that this was a novel thing at the time. In fact, Bach studied Fischer's pieces extensively, which only further proves Fischer's strong influence on the young Bach. Fischer opted for variety, and the implementation of different dances certainly succeeded in doing so. The only common throughout all the keyboard suites is that they all begin with a Prelude (Praeludium), with varying characters. These trace back to the French unmeasured preludes, but Fischer gives them a German touch. Once again, it won't come to you as a surprise that Bach drew inspirations from Fischer's preludes when writing his own Well-Tempered Klavier masterpieces. The dance pieces are very much French in character, and because of such, are all miniature pieces, fitting of the "musical flower" description. This doesn't mean that Fischer was a slouch in composing lengthier pieces. His 5th suite has only two movements, a Prelude followed by an Air and 8 Variations. Similary, the last suite has only two movements, the Prelude and a Chaconne. The Chaconne was a piece used by Lully to complete his theater works, and so it was natural for Fischer to conclude his set with this grand piece. This CD is played by Russian harpsichordist Olga Martynova. This is not my first Fischer recording, as I have his other set of keyboard works and actually played one of his suites personally. I do very much like Fischer's pieces, who is always able to construct great musical lines. Anyways, Martynova was a Russian pianist who decided to go Baroque after listening to Hopkinson Smith play. She has released a few recordings on the Russian label Caro Mitis. One of the more peculiar recordings (or interesting, however you want to put it), is her recording of some romantic piano works on the harpsichord, most of them which involve Shostakovich. Martynova plays on a Dowd French harpsichord, which has a light sound, ideal for the type of music being played here. Her playing is very solid and phrasing very smooth, which works superbly for the Allemandes and Preludes. For the faster dance movements, however, I would have preferred slightly even more articulation, something more punctuated, to bring out the spirit in the music. If you have heard Christophe Rousset play a French Courante or Gigue, you will know what I am talking about. That being said, this is but a minor detail, because she is overall consistently good with her interpretations. What more important though, is that this recording gives the listener a chance to get to know Fischer's music, which deserve much more credit than it does.